My son Karl, nine months, is already grasping the basics of halfswording. Posted: Fri 05 Dec, 2003 10:03 pm Post subject: LOL nice pic Bjorn! Good looking Boy there, congrats Bjorn! But for the love of God, don't let him go down the dark path of Italian Swordsmanship!! With a name like Karl, that boy is destined for Kunst des Fechten!!! Great picture. Looks like his dad! The eyes of a poet-warrior if ever I've seen one. I think your second pic says it all, though. Good looking kid there Bjorn. Doesn't look like he misses too many meals either. Apparently you are growing them big there in Scandinavia. Pictures like these are why I keep telling my daughter "I need grandbabies!" Oh, he's one healthy, cheery lad, and I'm so happy for him. 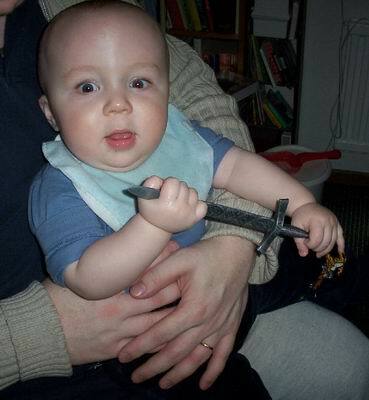 People ask me when he will get his first sword, and I say "not before the age of five". It will probably be later, but at least he will be used to sharp, pointy stuff by then, and know to use caution. There is something special about boys. My son is 17 months and everything he picks up is a weapon to him as he growls and attacks his nearest sibling. I keep telling my wife its just a boy thing it has nothing to do with my hobby... OK maybe just a little. As I am reading this my son Johnathyn (17months) enters my study with a metal ice cream scoop, brandishing it about. Obviously it is part of his short sword collection. He was playing with his war sword (the kitchen mop) about an hour earlier. To be safe he had on his great helm (his sisters bicycle helmet). 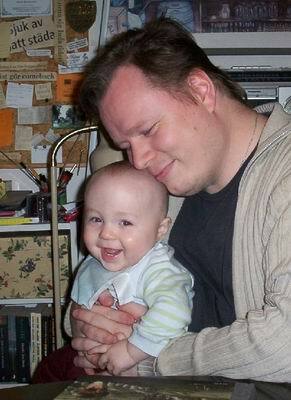 Good looking kiddo you got there Bjorn... Great smile. He is one happy boy in that picture with Dad! That's really one of the best dad/son photo I've ever seen. The facial expressions say it all. I agree with Andrew, that second picture is priceless. Those eyes and that smile are guaranteed to brighten anyone's day. Thanks Bjorn (and Karl). He sure is! Thanks for all the kind comments! And Patrick - stop bugging your daughter about grandchildren. You and I are the same age, and I've just become a father. You really want to be a grandfather before turning 40? Awww! 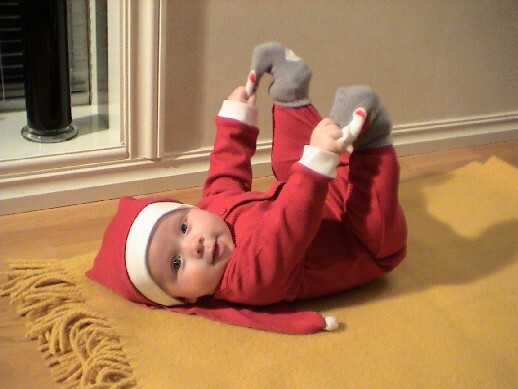 Titti just saw the pic, and she said that Oscar is an unusally cute baby, and I agree. Great to see that everything went well! Our greetings to the three of you - 2003 was a good year! My own boy made me proud last night. I go into his room (he's two) and he's playing with his little castle play set. Next thing I know he's saying "this guy has a sword" and then he wants to know what this guy is holding ( a mace) and this guy ( a flail) Yay!